uAvionix Australia – a leading provider of communications, navigation, and surveillance (CNS) solutions for manned and unmanned aircraft – announced today it has successfully completed testing of the Vektor Airport Ground Vehicle ADS-B transceiver at Sydney’s Kingsford Smith International Airport. The tests were conducted in coordination with uAvionix Corporation, the Sydney Airport Corporation Limited, and Airservices Australia. The tests were necessary to confirm that Vektor conforms to the pulse and spectral requirements for ground vehicle transponders. Airservices Australia found no known issues and stated the Vektor is fully interoperable with their Advanced Surface Movement Guidance and Control System (A-SMGCS). This is a first for the industry in that Vektor requires no Civil Aviation Safety Authority (CASA) exemptions to allow it to be used in Australia. Vektor is a 1090MHz ADS-B transceiver with transmit and receive functionality. At airports worldwide, ground vehicle incursion into critical safety areas is rising. Vektor minimises this risk by broadcasting the vehicle location to air traffic and ground control through ADS-B receivers and multilateration systems, as well as to local surface and airborne aircraft equipped with ADS-B receivers. 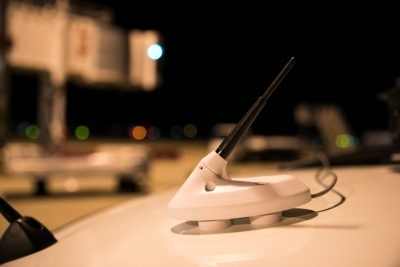 An integrated Wi-Fi hotspot can provide the ground vehicle operator with a situational awareness map of airport traffic on a mobile device. An integrated geofence system allows a map to be loaded which will enable and disable transmissions based on the vehicle position on or off the airport. Vektor can be permanently or magnetically mounted to airside vehicles, including tugs, fire, rescue, operations, and de-icing equipment.